The number of vegans and vegetarians in Mexico City has been steadily expanding for years now. Getting away from meat in a country with an animal protein culinary tradition as strong as Mexico’s is a challenge, but there are good meatless options around the city if you know where to look. Most of these places offer traditional Mexican food with alternative ingredients. 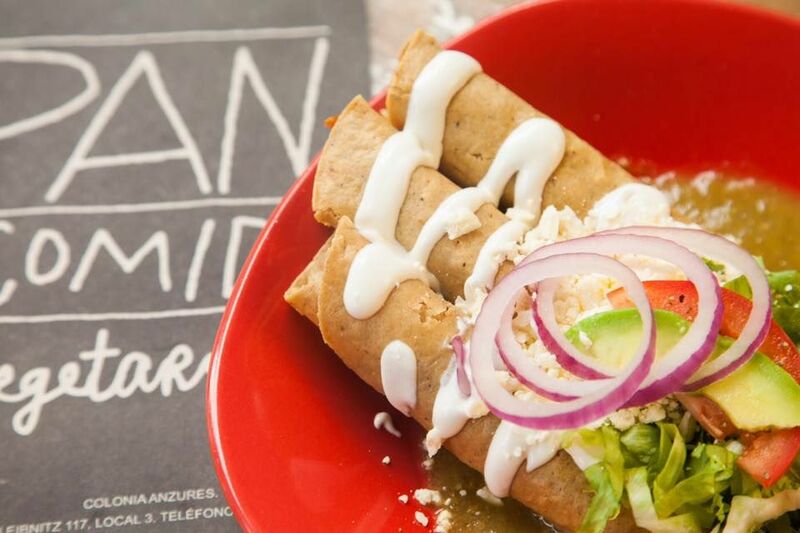 Here are top recommendations for the best vegan restaurants in Mexico City. Some people say there’s no good taco without meat, but this is because they haven’t tried the menu at La Pitahaya: mushrooms turned into tacos al pastor, jamaica (hibiscus) as the main ingredient of cochinita pibil, tofu machaca, cashew nut cheese, handmade tortillas, and their raw vegan taco — and, there are pink tortillas with black sesame seeds. Vegamo has salads, pizza, pasta, smoothies, and waffles, in a cozy comfortable setting. Once you’re settled and enjoying a matcha latte, you’ll find it hard to rush your time there. You’ll find other matcha-related delights here, from cakes to Mexican sweet bread, and drinks based on this green delicacy. They also have an excellent coffee, fresh fruit smoothies, and their very own raw vegan version of Reese’s. Visit their takeaway shop, where you’ll find coconut sugar and oil, sweet bread, vegan jello, ready-made dishes, and more. Narciso, a restaurant that combines traditional Mexican dishes, state of the art cuisine, and original flavors, is a few blocks away from the Diana Cazadora roundabout in Paseo de la Reforma. Their low-priced menu features colorful main dishes such as bean meatballs, wheat fritters, chickpea burgers, vegan enchiladas, and a vegan brunch (mimosa included. You’ll easily forget you’re in the middle of the city. Follow their social media channels for updates on their menu – and they make deliveries. If taquitos are your weakness, Gold Taco has you covered, with chicharrón, pastor, salchicha, chorizo, steak, and almost every taco flavor you might be craving. Their menu is huge and goes well beyond tacos: huaraches, baguettes, hot dogs, tamales, enchiladas, chilaquiles, pozole, ceviche, desserts and seasonal dishes, including chiles en nogada and Christmas time specialties. They also have a well-supplied store full of vegetarian and vegan products. Pan D’Monium is a street stand where you’ll find pizza, hot dogs, and hamburgers made of wheat and corn. They also run a bakery specializing in vegan bread, such as rosca de reyes and pan de muerto. Four dollars will get you a huge vegan combo, including beverage refills. The margarita and choriqueso pizzas are great, but if you’re really starving, go for their hamburguesa gula (gluttony burger) and a chia pudding. 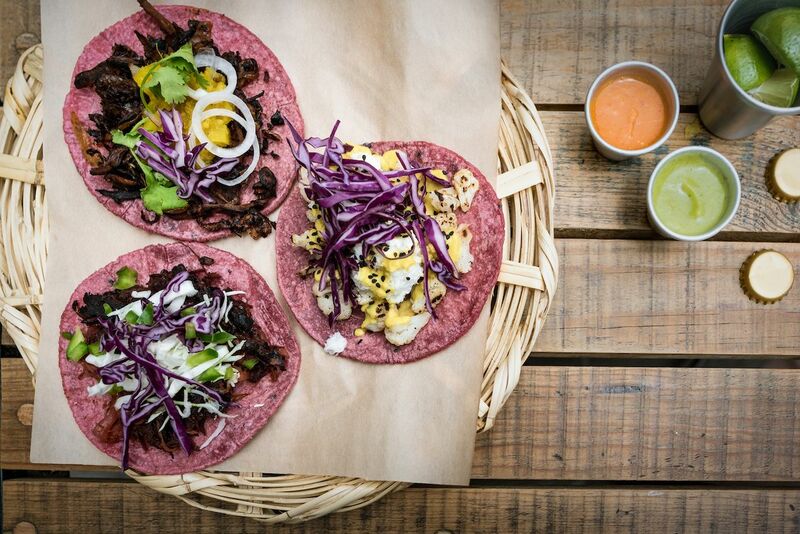 This restaurant is one of the pioneers in Mexico City’s meatless scene. It opened its doors in 1963. Its owners were some of the first to experiment with alternative ingredients. Vegetariano Yug offers a buffet and a menu that includes carnitas, salads, cannelloni, and other homemade dishes. Take your time and enjoy a little bit of everything, including their vegan flan, cake, and apple strudel. Don Falafel is home to the best meatless Arab food in Mexico City. The specialize in vegan falafels, but they also have tabule toasts, salads, and a daily menu of Mexican food with chorizo burritos, amaranth milanesas, soups, all of this in generous portions, with an amazing price. If you’re getting tired of burgers, pizzas, and salads, here you’ll find a vegan international menu, including tempeh, quiches, pad thai, noquis, paella and some delicious desserts and shakes. ELK also has a little shop where you can do your shopping. And don’t hesitate to bring your furry friends here, as ELK is pet-friendly. Pan Comido has the best burgers in town. The portobello burger with provolone is amazing, but if you want to feel those street food vibes, go for the Juana la Cubana torta, a sandwich with milanesa, sausage, chorizo, cheese, beans, avocado, onion, and tomatoes. For Morrissey fans, there’s a sandwich named after the artist. They also have craft beers and combo packages for lunch and breakfast. Patience is recommended when visiting Pan Comido as the place is always packed.